Published on Monday, October 3, 2016. This article appears in the October/November 2016 issue of American Craft Magazine. There’s both pathos and wit in Mimlitsch-Gray’s Candelabrum, Seven Fragments (2002 – 03). Myra Mimlitsch-Gray is well equipped and well trained. But of all of her tools, her ability to learn may be the most powerful. 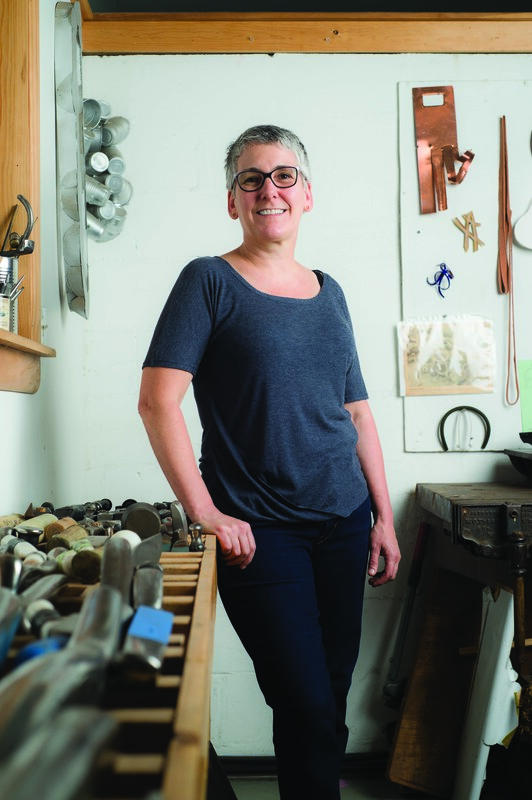 What has been most influential in the 30-year career of the upstate New York metalsmith is her willingness to embrace the ambiguity – the awkwardness, the anxiety, the reach into the unknown – that accompanies learning. Again and again, she has channeled that uncertainty into new, potent bodies of work. In 2007, she engaged in another shift – this one way outside her comfort zone. She became an artist in residence at the Kohler Co. in Wisconsin, best known for its porcelain kitchen and bath components and plumbing fixtures; there she cast iron and brass among the factory workers, whose process was “very rigorous, linear, specific, and meticulous,” she says. It was just the disruption she needed. “I had really run aground,” she says; her mastery of hollowware had become a crutch. “I really needed to find a new way of working, to put myself in the position of a novice.” When she returned to her own studio, she had to reacquaint herself with old techniques – which led to yet another body of work. “I found myself back in my own studio – my own little studio with my own little tools and my own thin little metal.” She began making loops of metal, forming them as if they were fabric, shifting her perspective from table to wall. Lately, she’s changed her practice again, experimenting with vitreous porcelain enamel on steel. She’s immersed in a new material and a new approach – along with a new openness to serendipity. “I’m learning to celebrate the incidental aspects that come out of the kiln,” she says. Day job: When she’s not in the studio, Mimlitsch-Gray directs the metal program at SUNY New Paltz. The look of function: Her primary gallerist, Sienna Patti, says people often point to a Mimlitsch-Gray work and ask her, “What it is for?” “There’s something inherently present in a metal object that suggests that it’s game for something,” says the metalsmith. 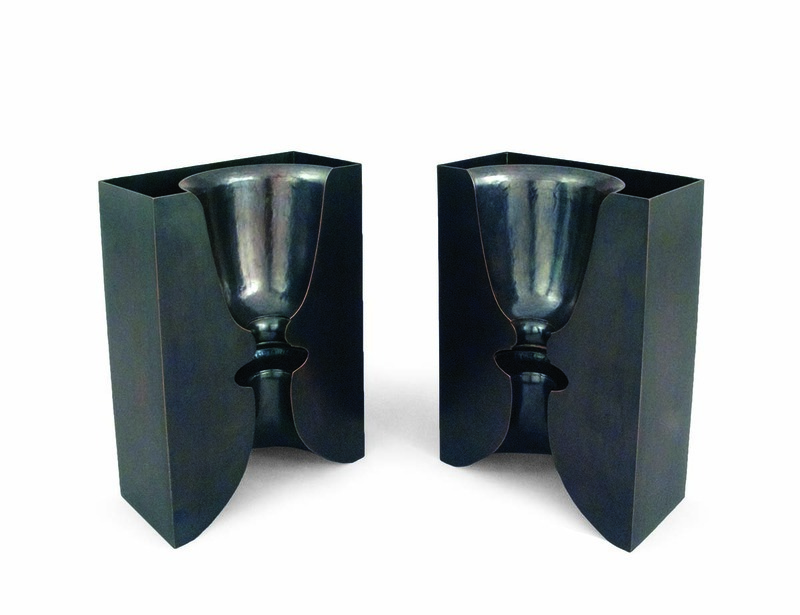 Decanters (1990) is among her many works that refer to the domestic realm. Mimlitsch-Gray has been making her wall works, which appear to drape like fabric, since 2007. 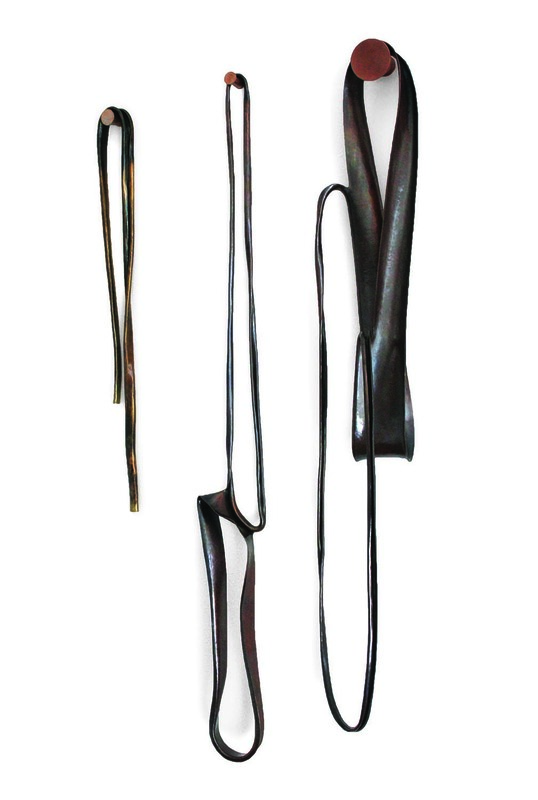 Split Slab (2012), of sterling silver, is a sculptural piece, but like many of the artist’s works, has a curious air of functionality.